For many years a small group of Burrillville volunteers provided weekend meals for needy Burrillville school children. Each week the volunteers would drop off backpacks to the schools that were filled with enough non-perishable food and snacks to last for the weekend. Abruptly this group dissolved at the end of December 2013 due to lack of funding. There was little notice, and no plan to continue to provide for these children.. In January 2014 a partnership was formed between the Department of Parks and Recreation, the Burrillville Lions Club, the Jesse Smith Memorial Library, and Berean Baptist Church to continue the program and help these needy students. 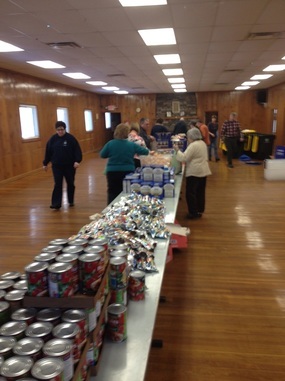 We have volunteers who pick up the food at the store, a location to store the food and an area to assemble the bags. We have volunteers to help pack and distribute the bags. What we lack is a funding source. There are approximately 30 children who receive the weekly backpacks. The average monthly cost of the food is $700. We have received pricing from local discount supermarkets and are researching fundraising options. We are asking for any financial assistance or non-perishable food donations you may be able to offer to assist with funding this worthwhile program. Please let us know if you are able to offer your support. In trying to avoid a delay of providing weekend meals to these needy children, your quick response would be greatly appreciated. Berean would like to collect non-perishable food items on Sunday Oct 2nd and Sunday Oct 9th for important social ministry. Below you will find a list of things to pick up while shopping.